Sometimes you need to play detective to determine the source of a washing machine malfunction. Use the following clues to help find the cause of your leaky washer, so you can decide if it’s a DIY fix or you need to call in a pro. Did you know the average American family washes eight loads of laundry a week? That translates to more than 400 loads of wear and tear each year! It’s no wonder that our washing machines develop leaks and inefficiencies over time. Fortunately, many symptoms that lead to a waterlogged room can be treated without a visit from a professional. So, if your overworked appliance has left you with a puddle all over your laundry room floor after your last load, check out the following leads to determine if it’s one of these most common problems—in both top- and front- loading washers—that require a DIY fix, not a service call. 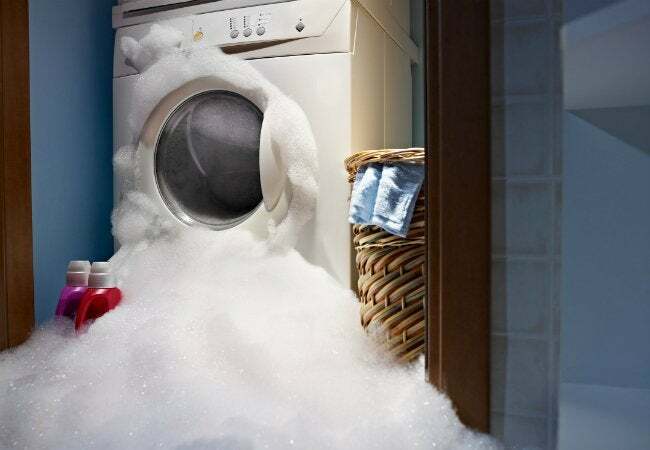 SCENARIO #1: You just built a pedestal for your washer and dryer, and now your newly situated appliance is spilling water out during the cycles. An unbalanced machine can cause the entire appliance to shake while it spins and agitates your clothes. The result: Some water spills out and accumulates on your laundry room floor. 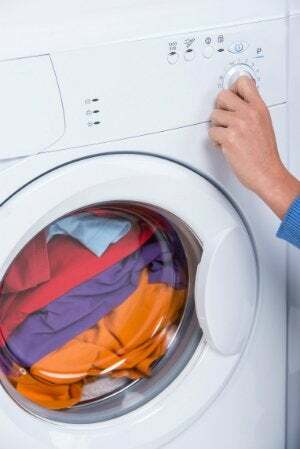 If you catch the leak in time, adjusting your washing machine pedestal or evening out the floor to stabilize the machine could do just the trick. Just be sure to use a level! SCENARIO #2: Water is leaking from behind the washer, which you recently installed yourself. Check to see whether you removed the manufacturer’s temporary plastic drain plug from the new purchase—or if you accidentally left it place when attaching the drain hose. A left-behind drain plug is no problem. Simply turn off the waterline, pull out the plug, and reattached the drain hose. SCENARIO #3: You observe water escaping during the “spin” cycle. When you’ve ruled out that it’s not an accidental oversight of leaving the plastic plug in after installation, carefully inspect the hoses for other signs of clogs, loose connectors, or other damage. A clogged drain hose prevents water from properly flowing down the drain pipe resulting in a backup of H2O, which has nowhere to go but onto your laundry room floor. This common problem often looks like a leak, but it’s actually a blockage. Tackle this easily by softening the clog with hot water and fishing it out with a straightened wire hanger, much like you might a clogged shower drain. Then rinse simply by turning the water back on. Loose connections between the hoses and the valves could also cause water leak back there. First, turn off the water supply. Then pull the appliance away from the wall to check and tighten the connection of the drain hose, the water hose to the washer valves, and the connections of the water hoses to the inlets. If not clogged or loose, it might be a damaged drain hose leaking from the connection between the pump and the back of the washer. It’s important to keep enough space between the washing machine unit and the back wall; otherwise the hose may rub against the wall, causing damage to the hose due to constant friction. Inspect the hose thoroughly. If you spot a worn out area or a leak, replace the hose and carefully move your appliance back into place. When you have ruled out all of the above as responsible for your leak, replace the fill hoses—damaged fill hoses can only lead to bigger problems if they don’t receive immediate attention. If a hole small enough to be missed upon visual inspection is the cause, the end result could cause significant water damage when the line gives way. SCENARIO #4: It’s official: There’s nothing wrong with the drain hoses, but water continues to seep out during the “spin” cycle. You’ve exhausted inspection of the hoses and it hasn’t solved the problem, so now it’s time to take a look at another potentially faulty part: the pump. A plugged pump occurs when dirt and other bits of debris (including miscellaneous pieces of fabric, like an orphan sock) build up in this appliance part and cause a blockage. If you’re lucky, an easy-to-clean coin trap accessible at the bottom of the machine will have caught the trouble-making debris; if your machine doesn’t have such a trap, simply remove the drain hose from its outlet and inspect back of your machine for a potential clog at this connection. Seals between the pump and the drain hose could also potentially cause leaks if too brittle or loose, so check to see that they’re secure as a preventative measure. SCENARIO #5: Only a few minutes into the load, and soap bubbles are everywhere. Oversudsing common occurs in either top- or front-loading machines, and it boils down to this to the amount of soap used. Repeat after us: Extra soap doesn’t mean extra clean. Instead, too much soap causes clogs in the overflow tubes, which could lead to leaks. Using the right detergent—and the right amount of it—is an easy preventative measure. • Top-load washing machines with a water softening system need simply to use less detergent for future loads in order to avoid oversudsing. • Front-load machines, however, take a small amount of a specific high efficiency detergent. If that’s your appliance, check the packaging of your detergent bottle for an “HE” label to make certain you have the right supplies. If you’ve ruled out all of the aforementioned causes and your washing machine still leaks, the problem is likely even larger and in need of a professional’s skillset. A leaky pump and faulty basket gasket or worn out tub seal and bearing all require specialized replacement parts and extensive disassembling of the machine, so it’s best to call in a pro to deal with that leaking H2O.